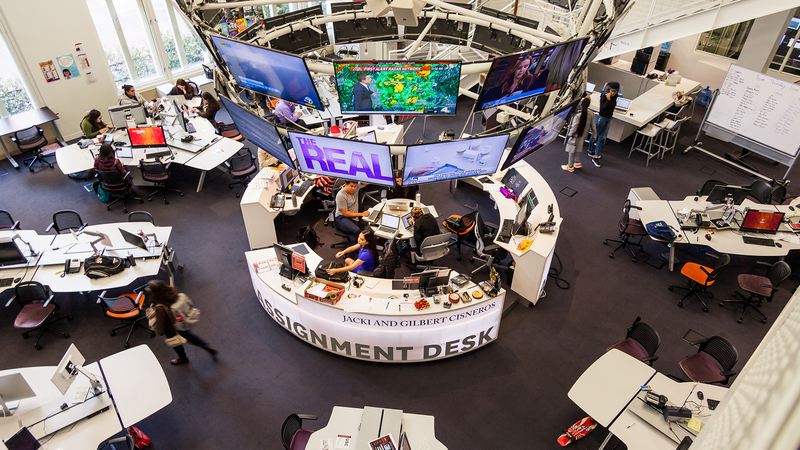 USC Annenberg’s Media Center is the heartbeat of Wallis Annenberg Hall. This unique newsroom, classroom and incubator provides experiential learning so students can work as journalists on day one, ensuring they enter the industry with the multimedia skills necessary to tell stories on every platform. With its cutting-edge production facilities and state-of-the-art equipment, students working in the Media Center cover breaking news on the web and on the air, create high-impact journalism on multiple platforms, produce and publish podcasts such as Match Volume, and integrate audience analytics. Whether they come to the Media Center as volunteers or as part of their coursework, students leave having fulfilled leadership opportunities that prepare them to succeed in the workforce. Faculty advisors with decades of industry experience as newsroom leaders, copy editors, programmers, network TV producers and communications experts guide the student editors and producers, lending a fresh eye to projects and finding teachable moments. With this foundational training and hands-on guidance, students gain the experience and confidence to experiment with new and emerging platforms as they arise. The Media Center is a space for conversation, disruption and experimentation, where students tell stories in Spanish and Mandarin, cover the community around campus and Los Angeles at large. They also bring innovation to the way the USC community gets news, with a sports newsletter, a weekly Instagram show and even an audio briefing on Alexa. USC student evacuees share their stories. The USC Legends are the new e-athletes going head to head with UCLA's esports team tonight. Explore the stories of the people who chose America. What exactly is Prop 10? South LA residents, many who are struggling with housing costs, discuss the hotly contested measure. ATVN broadcasts news three times per week. Students cover the 2018 midterm elections.